The stretch between Magallanes and Ayala Ave. along EDSA is not exactly the most ideal of sections for a bicycle sharing program. However, its success would be symbolic of a small and quick win for cycling in a metropolitan area that’s been perceived to be unfriendly to walking and cycling. The Metropolitan Manila Development Authority (MMDA) could have chosen other sections like a longer one along Commonwealth Avenue or perhaps a section of Circumferential Road 5 (C-5)/Katipunan Avenue like the stretch from Aurora Boulevard to C.P. Garcia Ave. that connects three major academic institutions: Ateneo De Manila University, Miriam College and the University of the Philippines Diliman. Marcos Highway, which stretches from Masinag Junction in Antipolo City to Santolan in Pasig/Marikina, was rehabilitated and now has exclusive bicycle lanes along either side of the highway. And, of course, there is the bicycle network in Marikina City, which is the first city in the country to have bikeways. A friend posted an article about “The Best Bike-Sharing Program in the United States.” It is a good read with lots of lessons for cities formulating their own bicycle-sharing programs. Such programs are made in part to encourage a shift from motorized transport to non-motorized modes like cycling and walking. With motorcycles becoming more popular in the Philippines, there should be strong efforts to promote bicycle use especially for short trips. 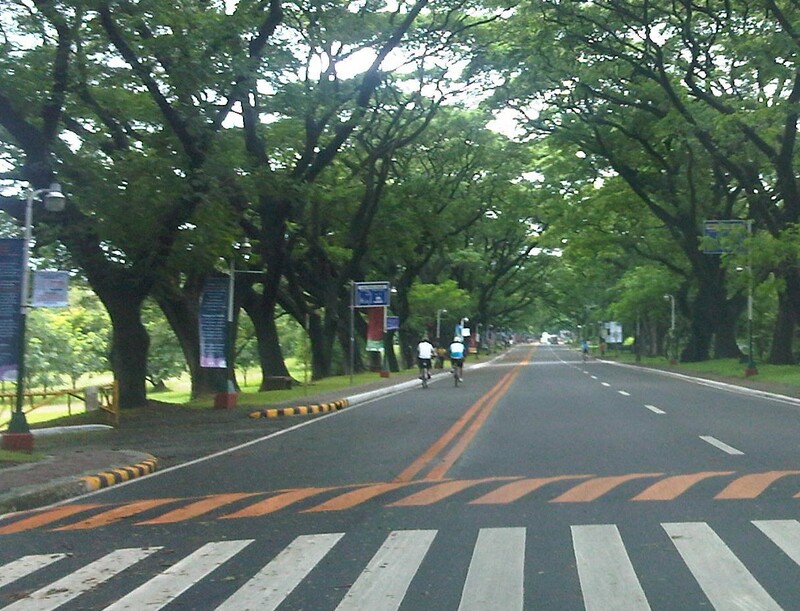 Cyclists pedaling along UP Diliman’s Academic Oval where one lane has been designated for NMT. Another perspective on promoting/encouraging cycling comes from Europe. I read an article that caught my fancy sometime last year and searched for it on the internet. The article appeared on the online version of the New York Times stating as its title: “To encourage biking, cities lose the helmets.” This is an interesting article because, for one, the author relates experiences in Europe that seem to be in contrast with those in the US. Particular mention is given to cyclists being required to wear helmets in US cities while many European cities are lax about this practice that is strongly associated with road safety. There I said it. Road safety. A primary concern for many if not most road users including those using bicycles is safety. In the cities where cyclists share road space with motor vehicles, crashes involving NMT and motorized vehicles may result in fatalities. Studies in the US have linked fatalities and serious injuries to cyclists not wearing helmets. However, in European cities where there are more cyclists and drivers of motor vehicles are probably more aware and respectful of cyclists, the perception is that laxity in helmet use helps promote cycling. In the Philippines, where mandatory helmet use for motorcyclists is a continuing enforcement challenge, strictly requiring helmet use for cyclists can also be a challenge and can be a turn-off for many would-be cyclists. Strict helmet-wearing requirements might be equated to cycling being a dangerous activity and therefore discourage a lot of people from using bicycles. Definitely, safety should not be sacrificed and where there are high risks but these sections need to be identified and enforcement along these should be firm. These include routes where bicycles and motor vehicles share the same road space. In routes, however, where there are exclusive space or lanes for cycling, perhaps the rule on helmets may be relaxed. Speed is one consideration here where those using bicycles for trips between their homes and workplaces or schools are not necessarily speedsters compared to those who cycle for recreation or for sport. Utilitarian cycling should be treated differently from recreational or sport cycling, which can be more risky and requires not only helmets but other safety gear as well. By d0ctrine in Cycling, EST, NMT, Transport Planning on February 1, 2013 .